Did ABC’s Earth 2100 go too far? 1. Nothing else was on. 2. The description on Comcast sparked the “go green”, “save the planet” part of me. We all know the facts so I wasn’t expecting a feel good show but I was expecting a show about hope and ways we can have a better tomorrow. Not! 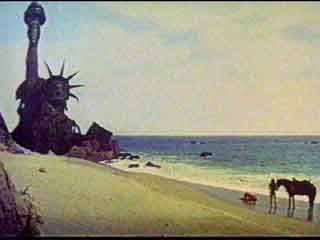 Earth 2100 was, in the end, an apocalyptic docu-drama with a sci-fi feel aka Mad Max or Planet of the Apes that droned on for 1 hour and 45 minutes based on zero facts and pure speculation. In the show’s remaining 15 minutes, the producers attempted to lighten the mood with a more hopeful depiction of what we can do to improve our fate but by then most people had either clicked off or tuned out. Plus, 15 minutes? Is that all we deserve to be hopeful that our planet can be saved? Between other blogs and comments in blogs, I couldn’t find a single word of praise for this show. Earth 2100 didn’t even do a good job in awareness. Hit the Discovery Channel or your local science museum if you want to learn about the real issues our planet faces…and you’ll learn we’re doing ok. Sure, we have issues to grapple with but at least we’re not ignoring them or taking them for granted. They are out in the open and being investigated. The portrayal of the human race shown in Earth 2100 is not what we are, not even close! If you have tweens and teens, this is one show they don’t need to view. Let them live their lives hopeful and knowing our world is ok – because it is, and it will be for their kids. If we all believe that, we’ll take the necessary steps to ensure our futures. If you have followed the April Copenhagen Congress on Climate Change, which brought together 2000 of the world's leading scientists, you will find that Earth 2100 is fairly conservative. In fact, we are not doing anything significant about climate change, and many of the scientists who put together the four UN IPCC reports of 2007-08 have stated that we need to be making major, global-wide changes now. Instead, we are still talking about it. The Copenhagen Congress warns of dangerous and abrupt climate change because of we are not acting now. Some scientists argue that we have already reached a tipping point, and that an increase of 7.3 degrees by the end of this century is not unrealistic. This show was not only based on excellent science, it was conservative in light of the Copenhagen Congress. If we really want to prepare ourselves and our children for a very different planet, likely to change significantly for the worse in the next 20 years, this is precisely the kind of wake-up call we need. If we continue to congratulate ourselves on changing a few light bulbs, we are simply hiding our heads in the sand and refusing to face the unpleasant realities we ourselves have created. This show could not have been more timely.